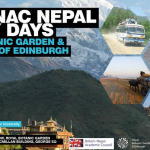 The Centre of South Asian Studies and BNAC were proud to host an event entitled The Radio in Nepal: Contemporary Debates, at 6pm on 18 April, 2011, room G2 at SOAS. Speakers include Devraj Humagain, Pratyoush Onta, Rama Parajuli and Bhagirath Yogi. Michael Hutt chaired the event. Please click here to download a PDF of the poster (1.3 MB).